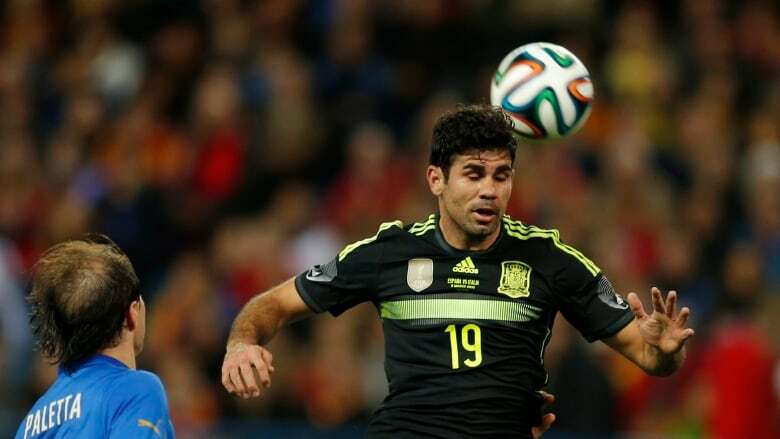 World Cup holder Spain included Diego Costa in its 23-man squad for Brazil despite lingering worries over a leg injury to the striker. Costa has been hobbled for weeks by a right thigh muscle problem, but coach Vicente del Bosque is prepared to gamble that the Atletico Madrid forward will be fit to lead the defending champion's attack. Costa, who is a Brazilian-born Spanish national, is expected to start ahead of Fernando Torres and David Villa, who were also in the squad. As expected, winger Jesus Navas was left out while Juan Mata was included despite a mixed Premier League season. Spain opens against the Netherlands on June 13 in a repeat of the 2010 final. The world champions also play Chile and Australia in Group B.
Sixteen of the 23 squad players who lifted the World Cup four years ago return for Spain. Del Bosque seemed to choose players like Mata and Torres on favor rather than obvious merit heading into Brazil, with Real Madrid playmaker Isco among those discarded. Bayern Munich midfielder Thiago Alcantara was unavailable due to injury. While Costa's inclusion was hardly shocking, Del Bosque's decision to base Spain's attack around a forward who has been nagged by a hamstring problem over the final two months of the season is surprising considering his options. Del Bosque stuck by Costa despite the availability of Juventus striker Fernando Llorente and Manchester City striker Alvaro Negredo. Negredo found himself starting from the bench over the close of the club season but Llorente enjoyed a strong debut season at Juventus with 16 goals. While Llorente was in the Spain team that won the World Cup four years ago and the European Championship in 2012, the Basque striker played just 31 minutes over those two tournaments. Del Bosque said Friday after Spain's 2-0 friendly win over Bolivia that he has faith in Torres, who scored just five Premier League goals this season. David Villa, the country's all-time leading scorer, has seen his production dip but can easily slide into Spain's possession-based combination game, with midfielder Cesc Fabregas expected to reprise his role as an unorthodox striker when needed. Pedro Rodriguez was also named. Nava's exclusion was expected after the Manchester City winger was sidelined down the stretch by an ankle problem. Apart from question marks over the attack, it is hard to pick out a weak spot in Spain's squad which was released on the team's official webpage on Saturday. Captain Iker Casillas will start in goal ahead of Pepe Reina and David De Gea, while versatile player Javi Martinez can step in for either Sergio Ramos or Gerard Pique at center back if needed. Cesar Azpilicueta's strong performance against Bolivia should cement the Chelsea back's spot on the right side of the starting 11 with Jordi Alba on the left. Fullback Dani Carvajal was ultimately omitted despite a strong debut season for European champion Real Madrid. Sergio Busquets and Xabi Alonso provide cover in midfield behind Andres Iniesta, Xavi Hernandez, David Silva and Santi Cazorla, while Koke could enjoy playing time too after a standout season that saw the Atletico playmaker help lead his team to the Champions League final. Spain is looking to win an unprecedented four straight major championships after also having won the 2008 and '12 European Championships.